Fig. 1. 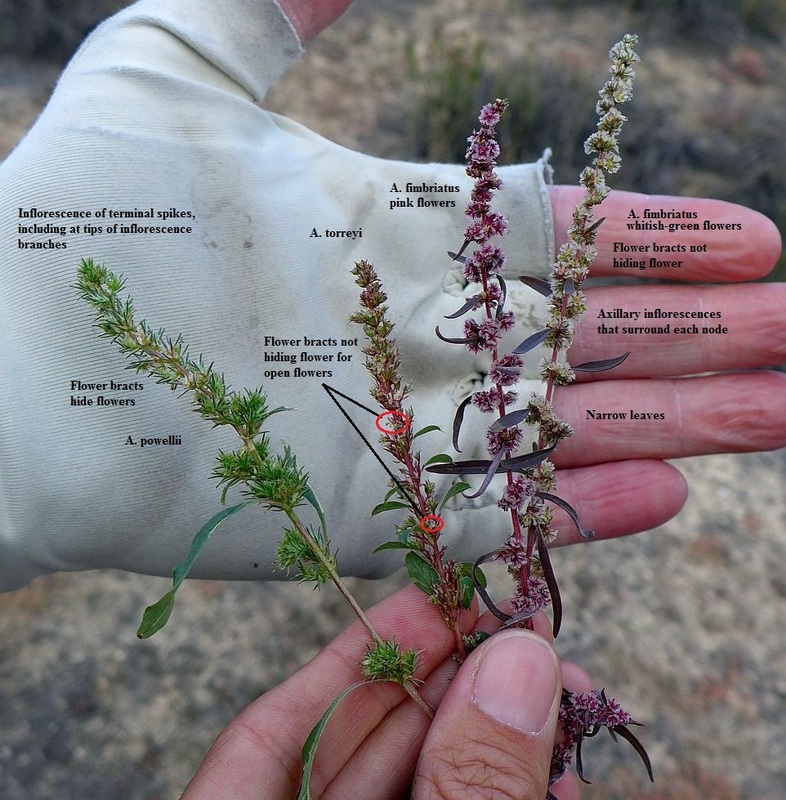 Three species of Amaranthus found on the PCT north of S22 on 2 November 2015, with some distinguishing characteristics labeled. Click on the picture for a larger version. 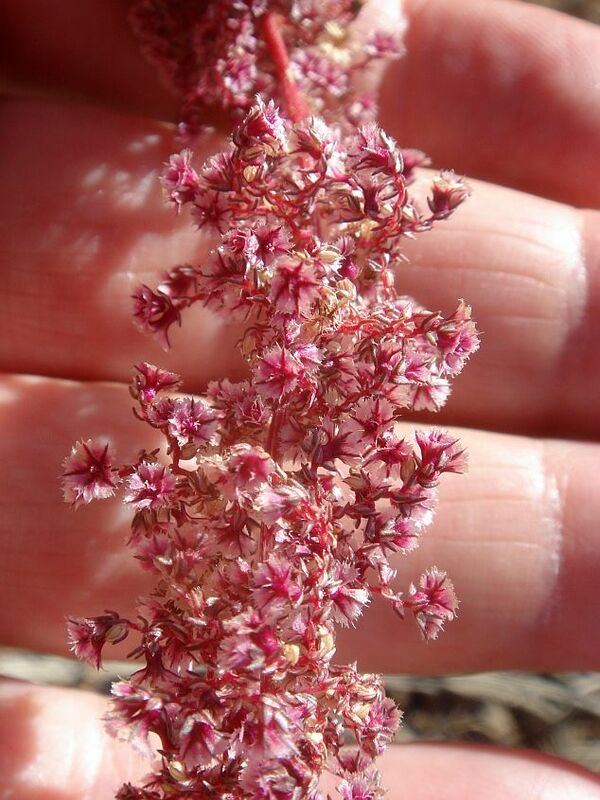 Amaranthus is widely known as a "difficult" genus, even though it has been the subject of many studies. In our very limited experience, it is extremely easy to misdetermine specimens. 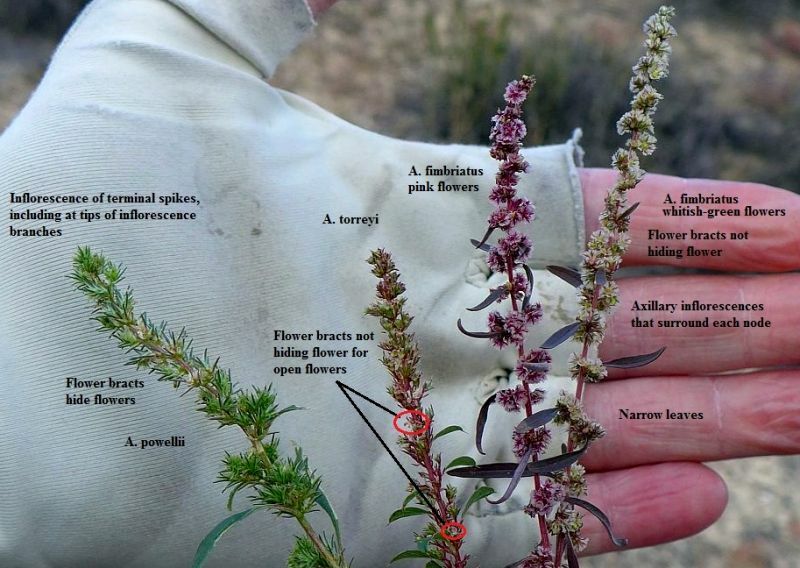 The purpose of this page is communicate some of the difficulties we have found in determining specimens, show some pictures of these species, and to give some tips as to how to distinguish the species with erect inflorescences found in San Diego County. Since we have just begun to work on these species, and have very limited experience with the difficult-to-separate species, some of what is given below is from floras or monographs on these species, not from our personal experience. It is often the case that plants in a given area are not exactly as described in floras or monographs, so it will not surprise us if some of the information given below turns out to be incorrect in some details. Fig. 1 shows examples of the inflorescences for three of these six species. 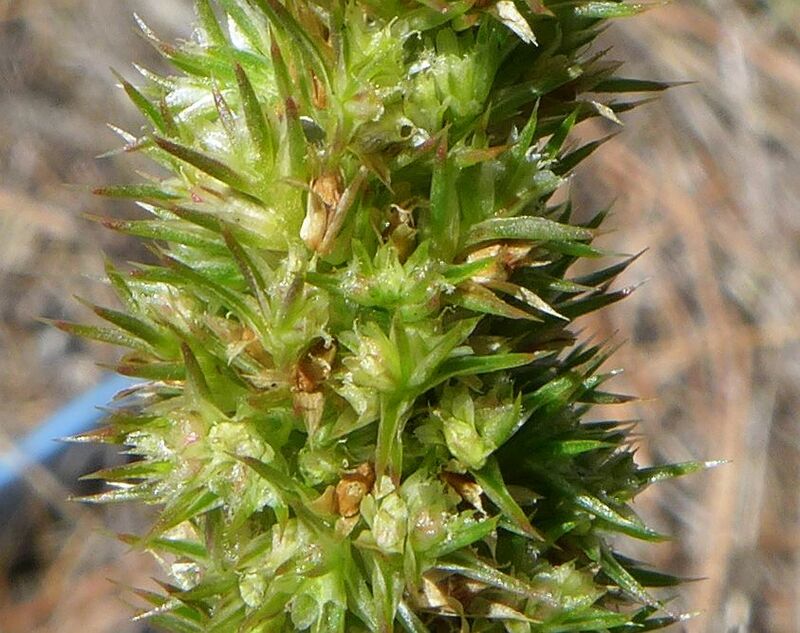 A seventh species, A. watsonii, may or may not be present in San Diego County. There are only two vouchers from San Diego County determined as A. watsonii, both from elevations well above the 100 m (300 feet) highest elevation given for that species in the floras. One voucher is of a number of quite depauperate plants of two separate species; one of those species appears to be A. torreyi and the other is A. fimbriatus. 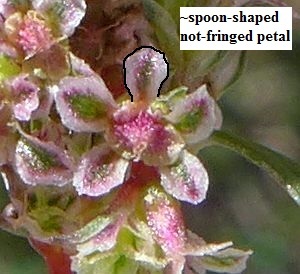 The other voucher specimen appears to have oblong petals, not the spatulate to fan-shaped petals given in the Flora of North America for that species. Until there is better evidence that A. watsonii is actually present here, we exclude it from the first part of this page. We do give a separate key that includes it at the bottom of this page in case anyone wishes to discriminate it from A. palmeri, the closest species to it in San Diego County. First, some terminology. 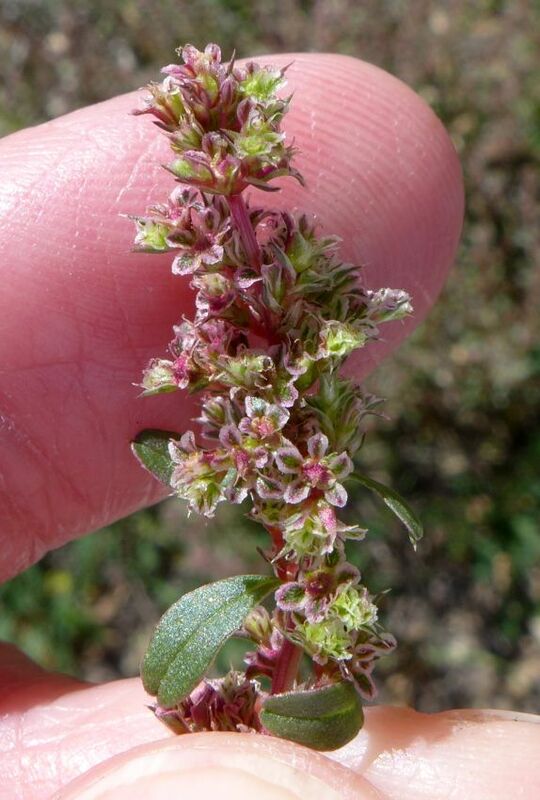 The petal-like parts of the flowers of Amaranthus are generally referred to just as the perianth, since they are considered to have petal-like sepals, and no petals. Most people looking at the petal-like sepals would just call them the petals. For ease of communication here, we'll call them the petals, too. Botanists desiring more precision can substitute "sepals" or "perianth parts" whenever we use the word "petals" below. Two of our species, A. fimbriatus and A. torreyi, are fairly easy to identify almost at a glance in the field: . Both of these species are the only ones whose flowers are not at least partially hidden by the flower bracts, making it easy to see the petals. You have to look hard to see the petals on the other species. Fig. 1 shows the flowers of each of these two species; you can just do a picture match to figure out which one you have. Fig. 1. 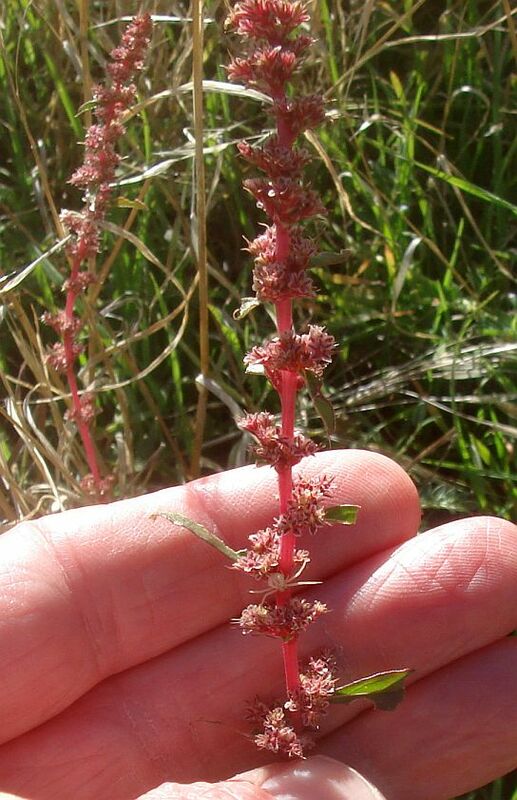 Left: The flowers of Amaranthus fimbriatus, with its fringed, fan-shaped petals, showing its pink/red form at top and whitish-green form at bottom. Right: The flowers of A. torreyi, with its ~spoon-shaped non-fringed petals. We don't know yet how variable the coloration of its flowers is. Click on the pictures for larger versions. A. fimbriatus is easily recognized by its fringed perianth tips and fan-shaped petals. The fan-shape here is the shape of hand-held fans often used by ladies in the past to fan air on their face, especially in the era before air conditioning. Both A. fimbriatus and A. torreyi also have a leafy-bracted inflorescence, with most of the flowers in axillary clusters that surround each node, with some flowers also in a terminal inflorescence branch without leafy bracts. A. torreyi can sometimes instead produce short branches at each node instead of axillary clusters, as shown in Fig. 1; its more frequent axillary cluster appearance is shown here. The male plants of A. palmeri are also easy to identify since every single flower is male, with very-recognizable anthers hanging out of the flowers; see Fig. 2. There is no need to try to hunt down any female flowers if you see a number of male flowers; no species with female and male flowers ever produces very many male flowers. Fig. 2. 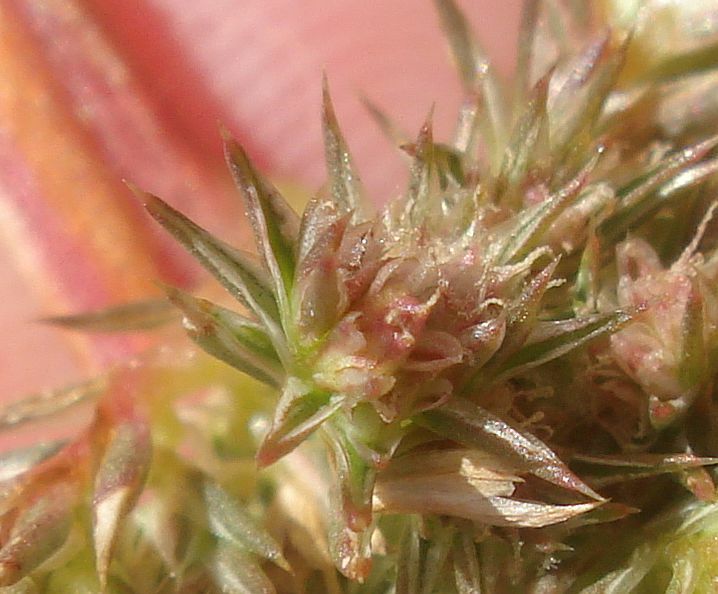 An inflorescence of a male plant of A. palmeri. Note that every flower has exserted yellow anthers, and that the anthers have four chambers, appearing four-lobed, in the shape of a cross when viewed from above their tip. 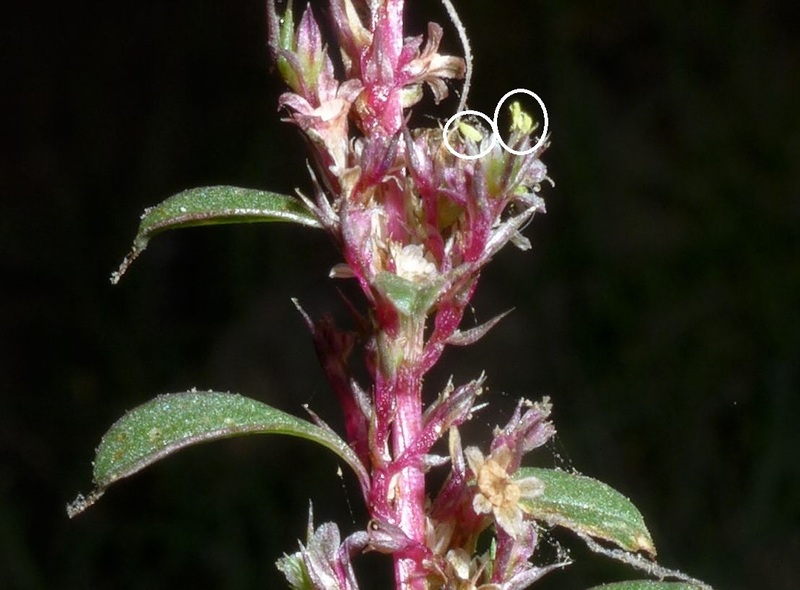 All Amaranthus anthers are four-chambered. Click on the picture for a larger version. 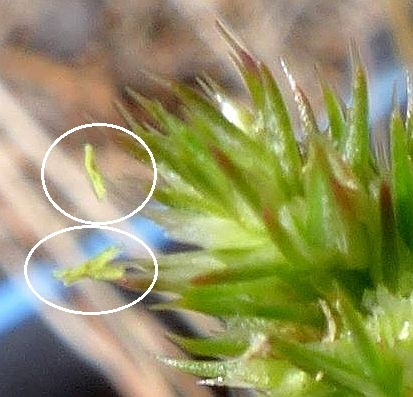 What makes female plants of A. palmeri, and the other three species, tricky, is even though the other three species have flowers of both sexes on the plants, the male flowers are often found only in small numbers, and hard to find. 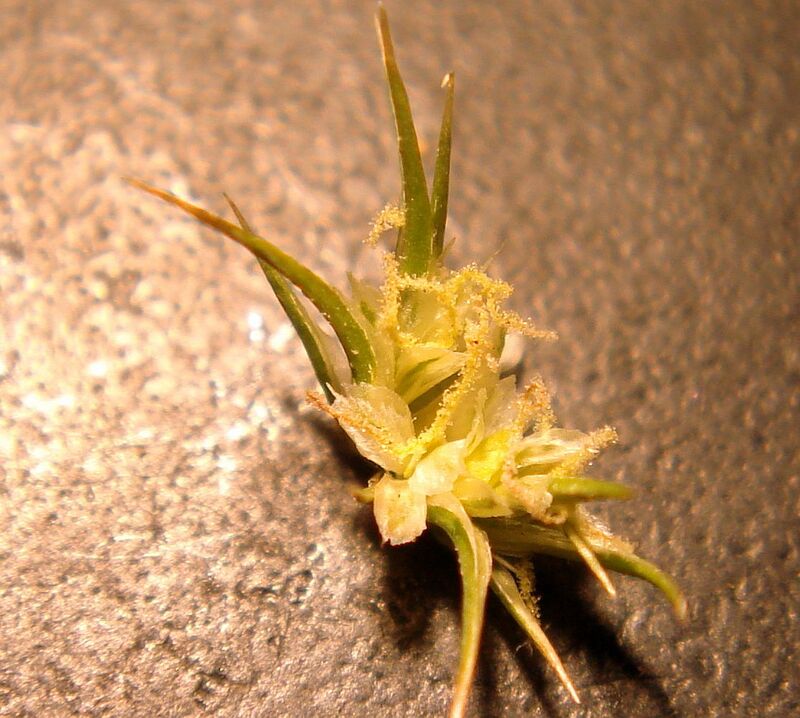 Worse, if the male flowers are not in full bloom, with exserted anthers, you might have to dissect the flowers to find them. Fortunately, the male flowers on the species that have both male and female flowers are always at the tip of inflorescence branches. Sometimes there are quite a few and easy to find. Most of the time one can find the male flowers at the tips by only examining a small number of inflorescence branch tips. See Fig. 3 for one example of a male flower at the tip of an inflorescence branch that otherwise has all female flowers. Fig. 3. 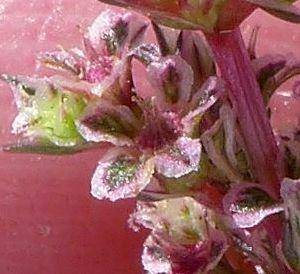 One inflorescence branch of A. powellii, showing the exserted anthers from two male flowers on an otherwise-all-female spike. Click on the picture for a larger version showing that branch; see also the main stem of the inflorescence with all female flowers. 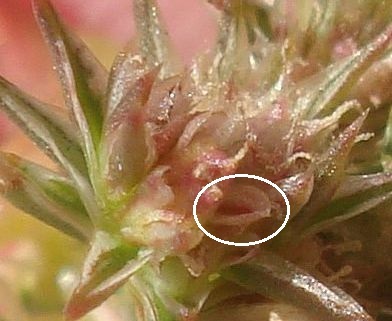 If you find at least one male flower at an inflorescence branch tip, then you know you have one of the other three species, and not a female plant of A. palmeri. However, if you do not find a male flower, it is hard to know if it was just hard to find one, and they do exist, or if they really do not exist. 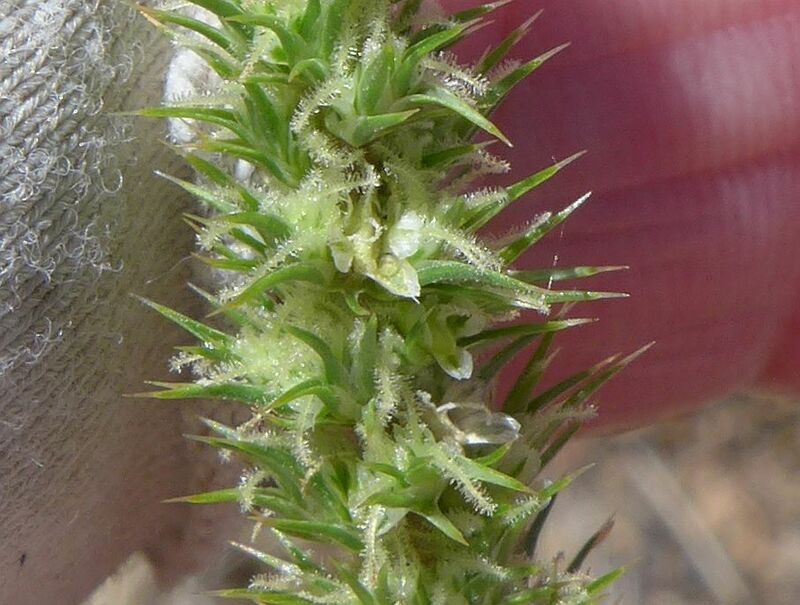 For example, we had to search hard to find male flowers on A. torreyi; this picture appears to show no male flowers; we had to search lower nodes to find a single male flower with fresh anthers (Keir Morse photo). 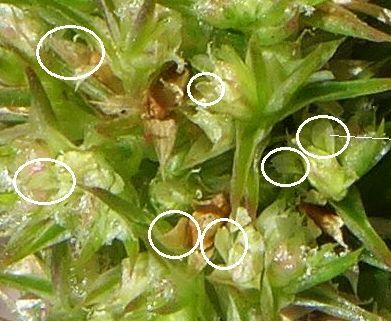 With another sample, we had to dissect the upper flowers to find the anther remnants, since the male flowers were no longer in bloom. 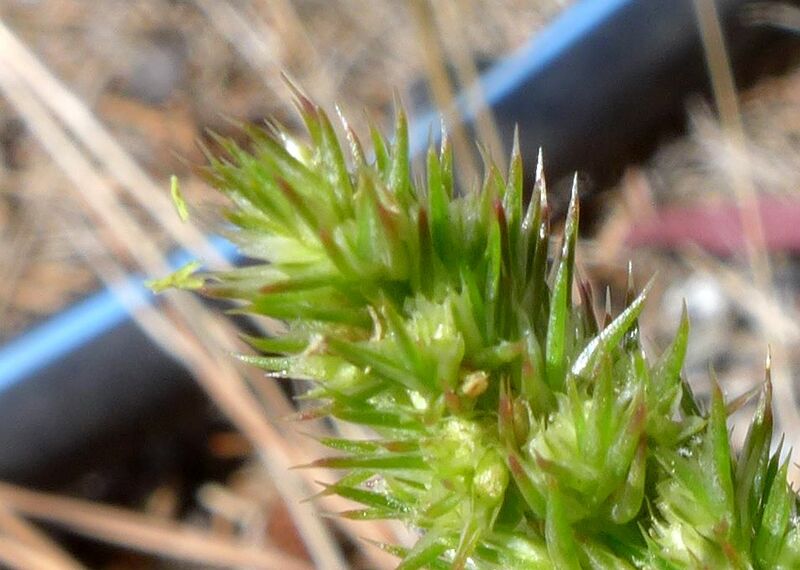 There is one fairly good test to perform in the field if you suspect you have a female A. palmeri: look around for a nearby male plant, which will confirm that you do indeed have A. palmeri there. If you cannot find a nearby male plant, you should examine a few more inflorescence branches to look for male flowers. 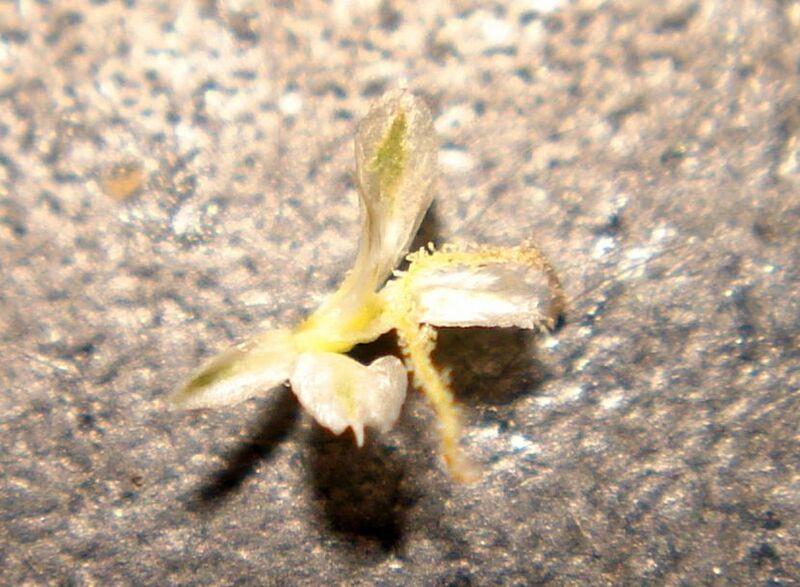 Here are photographs of female A. palmeri of a closeup of the inflorescence; of several flowers removed from the inflorescence, showing the bracts (the long green things), the petals (the white things), and the styles (the feathery yellowish things); and of the flower without the bracts. Note that there are just four petals in the last linked picture; A. powellii can have 3, 4 or 5 petals on the female flowers. 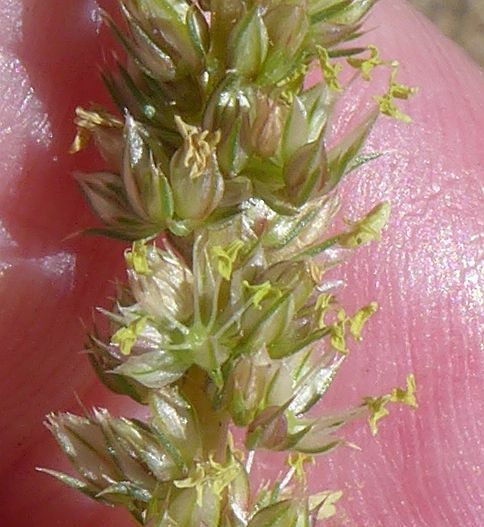 The remaining three species always have five petals on the female flowers, so finding fewer than five petals can help identify female A. palmeri. Note that observing the number of petals is probably very difficult in photographs, and if one has a sample, one must take care not to lose petals while removing the bracts. If you have ruled out the above three species, that leaves three very-similar species: A. hybridus, A. powellii, and A. retroflexus. These three species are part of what is called the A. hybridus species complex, composed of species that are very similar morphologically and difficult to separate reliably. There is no simple way that we know of to separate these three species. 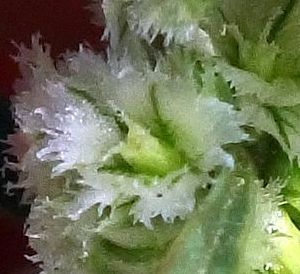 The separation involves fairly-minute details of the petals and flower bracts, which are mostly impossible to see without dissecting the flowers. Most people will be happier to simply stop here, and not try to distinguish these three species. For those who like a challenge, and have a sample in hand that they can dissect and measure, here are some tips to separate them. 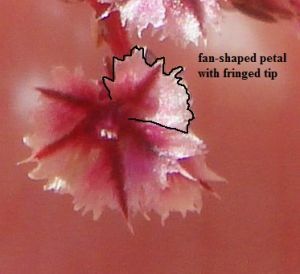 A. retroflexus has petals that overlap, that are spoon-shaped to obovate in shape, with tips that are rounded to notched below the minute bristle tip. We have not yet encountered A. retroflexus, so have no pictures of it. The other two species have petals that do not overlap, that are linear to lance-oblong in shape, with tips that are acute to awned. The Flora of North American has illustrations of the flowers of these three species, showing the difference in petal shape. A. hybridus and A. powellii are separated by minute details. 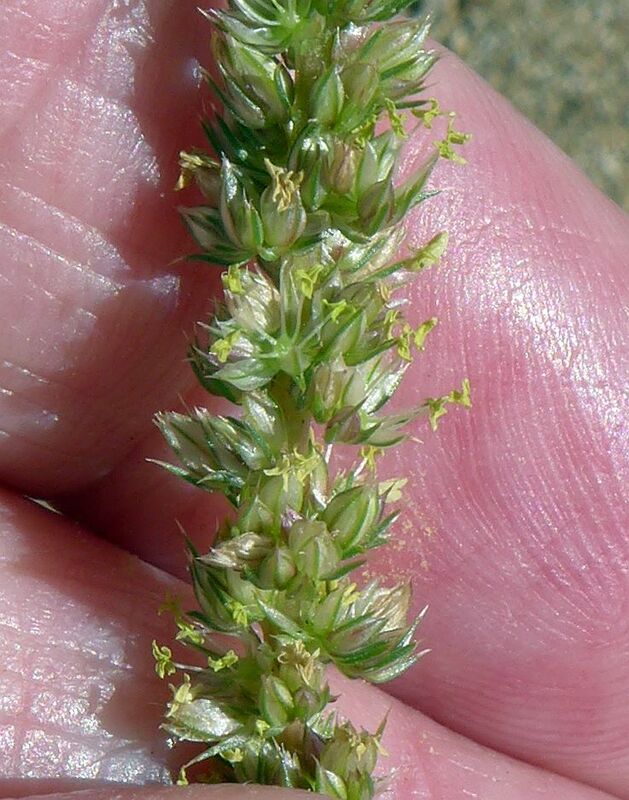 A. hybridus has petals with a conspicuous green or red midvein, and flower bract lengths of 2-4 mm. A. powellii has petals with an inconspicuous yellowish midvein, and flower bract lengths of 4.5-6 mm or, infrequently, longer. Fig. 4 shows the different-colored midveins. Fig. 4. 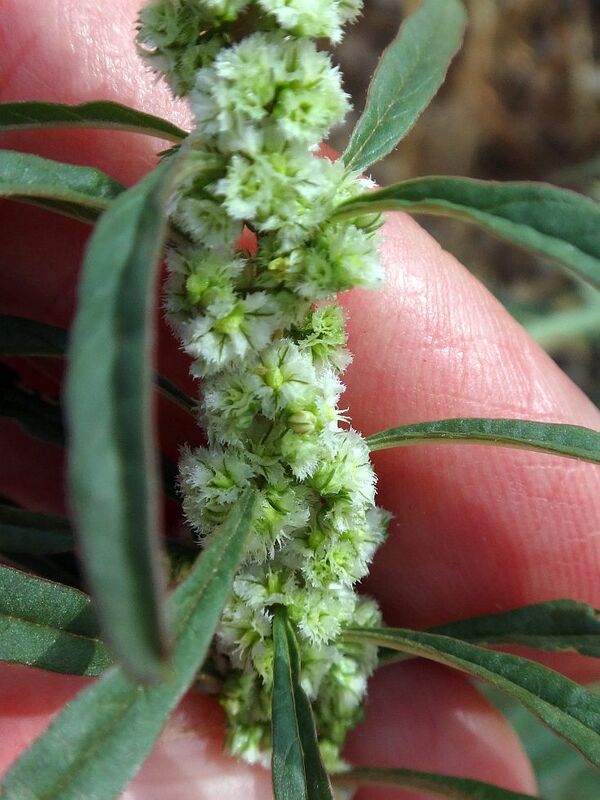 Left: The flowers of Amaranthus hybridus, Right: The flowers of A. powellii. Some of the petals are circled in white. Note the inconspicuous yellow-green midveins for A. hybridus, and the conspicuous red midvein of A. powellii. Click on the pictures for larger versions. Two keys are presented. The first key is a shorter and simpler key, with just five couplets, that does not include A. watsonii, since we doubt it is in San Diego County. Most people should use this key. The second key is a more complicated key, with eight couplets that contain considerable botanical jargon, that does include A. watsonii, to help in looking for that species to see if it might indeed be here. All photographs by Tom Chester except for the one linked photograph by Keir Morse attributed to him. Voucher data provided by the participants of the Consortium of California Herbaria (ucjeps.berkeley.edu/consortium/) on 6 November 2015.